Have you ever wanted to become a Jedi and fight off Stormtroopers using your lightsaber? Well now you can, as ILMxLAB's Trials on Tatooine virtual reality experience has launched on SteamVR for owners of the HTC Vive. The game places you on the desert planet of Tatooine as a Padawan, a Jedi in training, helping out R2-D2 defend the Millennium Falcon from incoming Stormtroopers. The entire experience is pretty short from all reports, but it features iconic imagery and sounds from the Star Wars universe that's sure to impress fans. The system requirements for Trials on Tatooine are pretty simple: you'll need a system that meets the minimum requirements for the HTC Vive – an Intel Core i5 and an Nvidia GeForce GTX 970 – to enjoy the game on its lowest settings. For better graphics on the game's highest settings, ILMxLAB recommends a GTX Titan X alongside an Intel Core i7 CPU. 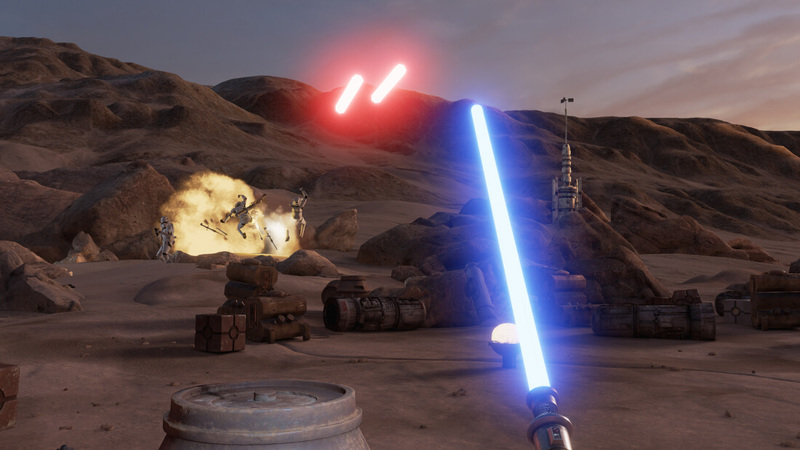 Trials on Tatooine supports both room-scale and standing play areas, although as you'll be swinging around your motion controller as a lightsaber, it's best to ensure there are no hittable objects nearby. The best thing about Trials on Tatooine is that the game is completely free, and can be downloaded right now from Steam. Unfortunately there is no support for the Oculus Rift just yet, mostly due to a lack of motion controllers for the Rift, but that could change when Oculus finally releases the Touch controllers later this year. And it's a good thing it was free. A lot of it was just looking around (aka, waiting) and then only minutes of it was the shallow lightsaber part. Probably 10 minutes long at most (which includes the classic intro and credits). Basically, if you want to play a Star Wars game, this is not for you. It's all cinematic. If you want to look at some cool visuals like the Millennium Falcon landing beside you or R2-D2 roll by, then by all means take several minutes to go through it.